I recently had the good fortune to interview a couple who have successfully taken their young children to visit over 20 Mayan ruins in Belize, Guatemala, and Mexico while researching their book; “The Jaguar Stones Book 1: Middleworld”. 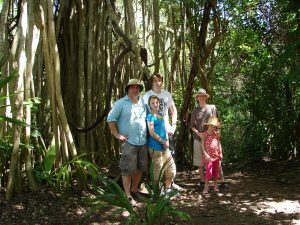 J&P Voelkel believe that adventure travel is less stressful than a week in Disneyland and graciously shared some insight into how we can dare to leave the resort and experience the history and culture of Mayan ruins with kids. I can’t thank them enough for their insightful, witty, and truly helpful advice! Which Mayan sites did you visit with your children? In Mexico – Chichen Itza, Uxmal, Dzibilchaltun, Ek Balam, Mayapan, Kohunlich, Dzibanche, Kohunlich, Calakmul, Chicanna, Becan, Kabah, Labna, Sayil, Xpujil, Hormiguero, Balamku, Ake, Yaxchilan, Bonampak, Coba, Tulum, Izamal, Acaneh, and Palenque. How old were the kids at the time of the trip(s)? 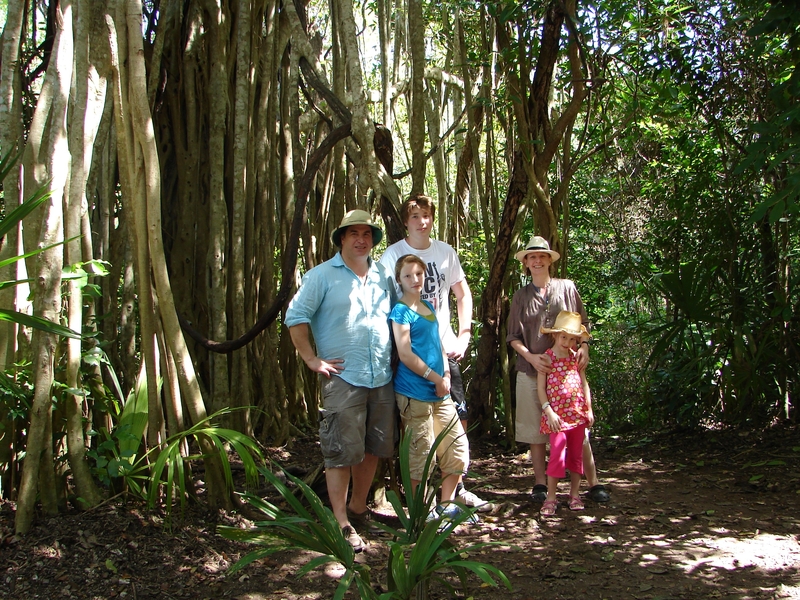 Our first trip to Central America, to Belize, was five years ago, when our children were aged 2, 8 and 11. We’ve been back every year. Why did you choose the sites you visited? We chose Belize for our first trip because our book is set in an English-speaking Central American country based on Belize. It also seemed very family friendly, which gave us the courage to take a 2 year old. The actual hotels were beautiful (we stayed at the Turtle Inn on the beach at Placencia) and at Blancaneaux in the Mountain Pine Ridge Reserve. We started with an easy time at Placencia – taking a boat down the Monkey River, tracking howler monkeys in the jungle and manatee spotting in the lagoon. From Blancaneaux, we tackled the major sites of Caracol, Cahal Pech and Xunantunich. Since then, we have tried to work our way through the major Maya sites. The only one that seems formidable to reach with children is Copan in Honduras. We’re still working out how to do that one en famille. Were they fairly accessible for children? Most Maya sites are a children’s paradise – crumbly old pyramids to climb, secret plazas, monkeys and parrots in the trees, lots of space to run around, paths through the jungle, kings with funny names like Smoke Monkey and Curl Snout. It’s the getting there that can be tricky – the roads are often bad to non-existent and it’s always a long, boring, bumpy drive. Except going to Xunantunich in Belize, which is really fun because you put the car on a hand-cranked ferry across the river and watch the iguanas drinking at the water’s edge. Tune in tomorrow to find out the biggest challenges of adventure travel with kids and how to overcome it, as well as advice for us on how make an adventure travel trip like this with our family. Chabil Mar Villas boasts almost 400 feet of private beachfront and is the only gated community in the area. The Inn at Robert’s Grove occupies 22 acres of land between the Caribbean Sea and the Placencia Lagoon located approximately 120 mile flight from Belize City and one mile from the Placencia Airstrip. The property amenities include three outdoor pools that overlook a white-sand beach, open-air massage room, fitness equipment, gift shop, dive shop, fly fishing center, tennis court, whirlpools, day trips to the rainforest and Mayan ruins, two restaurants, and two poolside bars. The property rooms are equipped with amenities like air-conditioning, ceiling fans, private terraces, hairdryers, safes, telephones, and mini-refrigerators. I am so glad that I ran across this blog! I look forward to your future posts and topics. Good job!! When people think of Africa they also think of a great adventure. My kids are at the age where traveling with them is a bit of a challenge. They are old enough to have opinions on our family travel plans but young enough that final decisions are left to me and my husband. We went to RivieraMaya last summer and we had a perfect time! My wife and I love Belize. We needed a vacation and took our 2 year old girl and 3 month old boy with us. Mom and boy stayed in the shade while dad and daughter were out playing in the waters at The Split. We will be returning to Guatemala and Belize in the future with our kids now 6 and 4. Next year dad and daughter are heading to New Zealand to explore with a campervan and watch rugby games during the Rugby World Cup 2011. We have a blog and I am sharing it with you here.